2012 Joint Aquarium Fiji Expedition Begins! For the past several years, the New England Aquarium has participated in a joint expedition to Fiji, along with the Monterey Bay Aquarium and other conservation-minded groups and individuals. The last expedition took place in October and November 2010. 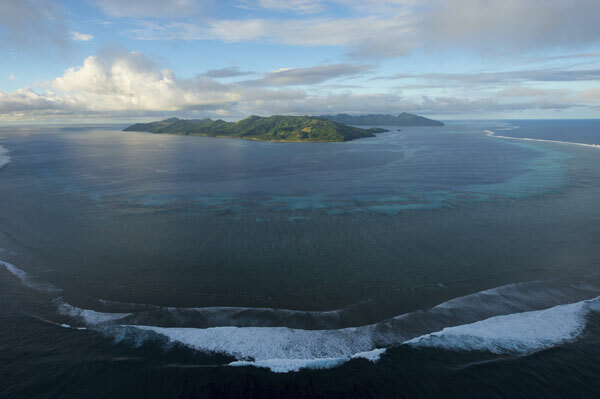 Once again, this year the expedition team will dive to collect data on the health of the coral reefs, pick up trash where they find it, check in with the villagers to see how some conservation initiatives are faring and further develop connections with the people that live on these beautiful Pacific islands. This year is no different, and the agenda for the expedition is just as ambitious! Divers on the boats intend to return to selected reefs to see if there have been any changes over the past couple years. This data will definitely be helpful to Dr. Stacy Jupiter, who is currently working on reef protection projects such as implementing no-take zones. 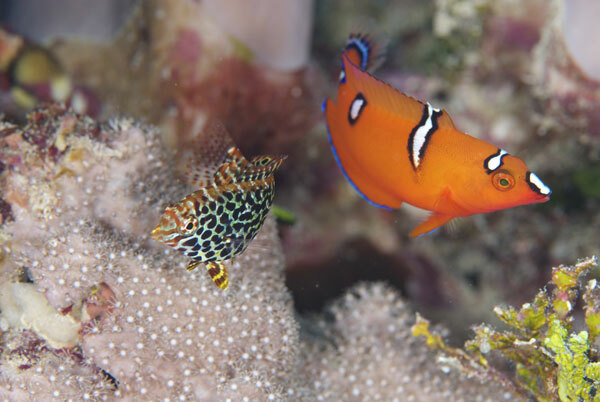 and at right is a juvenile clown wrasse (Coris gaimard). (Photos: Keith Ellenbogen from this 2011 photo series). Divers will return to Mount Mutiny for the fifth time, this time with special software that will allow some of the participants to do photo analysis of the reef. On Vatu-i Ra, the group will pick up rubbish and look for the recently rediscovered Fiji petrel. The trip would not be complete without a visit to Makogai Island, where the explorers will examine local corals and check in on giant clam farming efforts. Here's a trip video from the 2010 expedition. Throughout the expedition, look for pictures and posts from our adventurous travelers, including Steve Bailey, New England Aquarium Curator of Fishes; Dr. Steve Webster, retired Monterey Bay Aquarium Senior Marine Biologist and lifelong educator; Dr. Stacy Jupiter, Wildlife Conservation Society's Director of Fiji Program based in Suva; plus many individuals with special connections to the New England and Monterey Bay aquariums. Join these explorers from the New England Aquarium as they travel around the blue planet. Click to display Sal's posts. Dr. Salvatore Cerchio is a marine mammal biologist who has studied free ranging populations of cetaceans around the world for more than 30 years. He is currently a Visiting Scientist at the New England Aquarium. In November 2015, he traveled to Madagascar to study Omura's whales. Click to display Brian's posts. Brian Skerry is the Aquarium's Explorer in Residence and an award-winning National Geographic Magazine photographer who specializes in marine wildlife subjects and stories about the underwater world. Click here for complete list of past authors. An image watermark specifies a copyright directly in the image, but a copyright can also be clearly indicated in text near the image. Request image use permission, with this form.